Celebrate Christmas in Style with Both Zombie & Non-Zombie Members of Your Family! Christmas is a time for family, but what happens if a member (or 2 or 3….) of your family is a zombie? Well personally I don’t think they should miss out on Christmas celebrations which is why I’ve decided to write out a plan for celebrating the holidays safely with both zombies and people who love zombies. I’m going to show you ways to enjoy the season from decorating to eating a great Christmas dinner together so if you want a guide to celebrating Christmas with zombies this is it! For the sake of this article I’m going to assume that at least one member of your family is a zombie which also assumes there are other zombies around which means you will need to take safety precautions because nothing ruins Christmas like an unexpected zombie bite – especially one that could have been avoided! Are Any of Your Family Members Zombies? I’d love to know more about my audience so that I know what kind of tips will be more helpful for you to help plan your holiday season in a zombified world. There’s just something about Christmas music, don’t you think? Listening to classic tunes as you do your Christmas shopping or decorating your home just adds to the whole mood of the event. 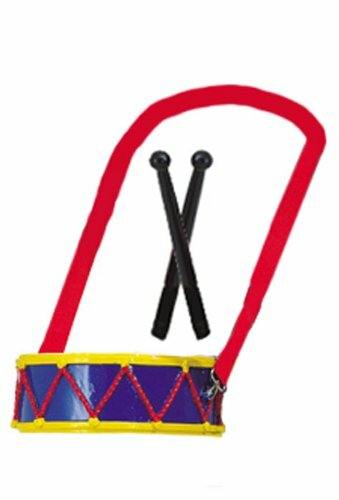 The advantage of music too is that zombies find it very soothing, almost mesmerizing – until it stops and then you can be in trouble so if you like to join carolers during the holidays – don’t! The group of carol singers enthralls zombies who will follow them as they sing to their audience, but once they stop …… well zombies get hungry it’s not really their fault. I think the safest bet is to just play some of your favorite tunes in the security of your own home with the windows boarded up and the doors locked. Let’s not forget a song that my Gran used to enjoy singing, although she didn’t know this version! Now you don’t want to be spending your holiday season fighting with zombies who don’t have anywhere to spend the holidays with do you? This means that even though it’s the season of goodwill you will need to remember your family’s safety and this means keeping the window’s boarded up. Does this mean you can’t decorate? Absolutely not! There are lots of ways in which you can transform your home in true Christmas style, so let’s see how we can do it. For me the first thing that says the holidays is a Christmas tree and what better than a Zombie inspired Christmas tree this year? For the next part of decorating we look at the windows, now just because they’re boarded up doesn’t mean that you can’t give them some festive flair. First you can hang lights around the windows, either icicle style lights like this along the top of the window or the traditional Christmas tree style lights around the whole boarded window. If you’re usually singing, ‘let it snow, let it snow, let it snow’ in the lead up to the holidays then you can still have a little winter magic inside your home. This fake snow isn’t just for glass, it can be used on your boarded up windows too. You can go free hand with some cool designs, use some Christmas stencils or just put a little bit of snow along the bottom of the window as though it’s just landed there! When it comes to the mantle, you can still hang stockings over it. Do make sure you have a fire going all throughout the holidays though, I would hate an errant zombie to find his way down the chimney instead of Santa. Of course while we’re talking about the mantle, you do need to put all of your Christmas cards on there as well. Depending on how rampant zombies are towards these holidays you may find that you don’t receive many (if any) greeting cards. I wouldn’t worry about what you do or don’t receive however as long as you make the effort yourself – after all they say it’s the giving not the receiving that counts. I’ve found a great selection of Christmas cards for you to give to your friends and family. It’s likely that the postal service won’t actually be running so you’ll have to hand deliver them. Simply take your zombie family member on a lead to deliver the cards and that way any stray zombies will keep away. Now I would recommend that you put a muzzle on them as if they see too many other zombies they could get a little more animated than usual which means a little bitey and someone has to remain human in order to organize Christmas! Now I don’t know if you don a Christmas t-shirt or an ugly sweater at Christmas, but I’m sure you at least wear something festive. I’m assuming that you’re keeping any zombie family members in the main living area so that they can enjoy all of the festivities and that they’re safely shackled up to avoid any unnecessary ‘accidental bitings’ which means you can add something to their outfits. Some people would suggest a Santa hat, but I’d save them for the human members of the family as sudden lurching in an attempt to bite fellow family members can cause the hat to fall off or over their eye which can become disorientating and make them more aggressive. A great idea is a Christmas necklace – you know the sort of plastic flashing jewelry that shop assistants (and possibly your aunt Edna) wear to put you in the mood to spend money. This is the type I mean, now pop a muzzle onto your zombie and then undo the necklace and wrap it around their collar for a very festive touch. 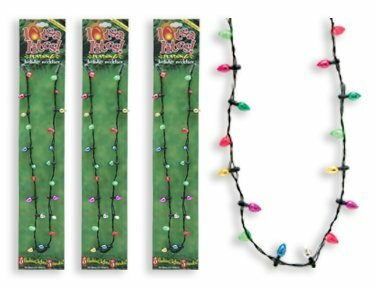 It’s like a holiday fashion accessory and a holiday decoration at the same time! I don’t know about you, but one thing about Christmas is that it’s a time for eating too much and gorging on festive treats like mince pies, Christmas pudding, gingerbread men and more. What do zombies like to eat more than anything else? Brains of course! Now you can’t exactly get a human brain at the supermarket or even at a butchers shop so how can you make their holidays extra special? The trick is organization and planning ahead so that they can have a delectable feast just like their human family members. You should be able to buy a cow or pig’s brain for their main course, but to make it extra special you want to add some human blood which is where the planning comes into play. In the lead up to the holiday season blood banks generally make a concerted effort to get more supplies to stockpile. You need to either befriend someone who works in a blood bank or become a volunteer yourself. Once you get access you’ll need to slip a bag or two of blood into your own bag to take home. Once you get the blood home it’s very important that you freeze it straight away. Once frozen zombies can’t smell the blood, if you have human blood lying around ‘fresh’ then it will drive any zombies that live with you absolutely crazy and extremely bitey around you! When you’re preparing your big Christmas dinner simply let the blood thaw out and then serve up their cow or pig brain with human blood poured over it in the same way you’d pour gravy over your turkey (or holiday meat of choice). They will absolutely love it even though they don’t show their emotions you can be sure they’ll leave a very clean plate and somewhere deep inside they will appreciate what you’ve made for them. What About Zombie Treats to Snack On? Of course it’s not just about what to feed your zombified family member for Christmas lunch/dinner, it’s about all of the festive snacks we have on offer during the holidays. I mean seriously can you see them eating gingerbread men, candy canes or even sugar cookies shaped like Santa or a Christmas tree? Get any of the entrails or offal that you can from a butcher and put them all through a grinder together – you want to get it into a fine grind. Pop any eyeballs you can get into your mixture (these are delicacies by themselves). Now place the mixture onto some parchment paper, fold it over and proceed to roll it so that it makes a roll. Twist the two ends of the parchment paper together so you get the look of a Christmas bonbon. Next place the parchment paper covered ‘roll’ on to some tinfoil and wrap again, twisting the ends tightly. Add the ‘roll’ into a pot of cold water and cook slowly over a low heat (it can simmer slightly, but you don’t want it to boil) for 40-50 minutes. Remove from water and allow to cool before removing from the foil and parchment paper. When it’s cold you can cut it into slices like it’s a piece of salami or liverwurst. Once you’ve cut this ‘roll’ into slices you just take one of these metal cutters and cut it into festive shapes for them to enjoy – perfect. Now admittedly they’d probably prefer raw entrails, but I’m told they’ll still eat this and it sure looks more festive when they’re eating candy cane shaped ‘sausage’ than a bowl of raw entrails! When it comes to the human family members you can still pay homage to your zombified family members by preparing delicious treats for your holiday season. 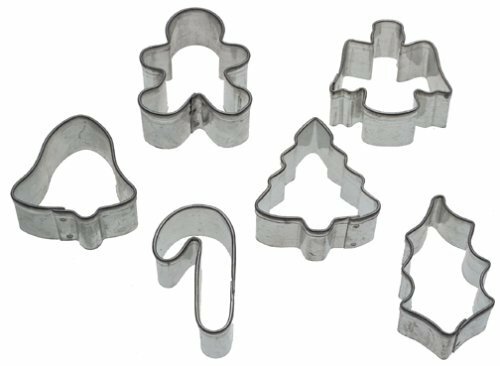 Simply make their favorite sugar cookie, shortcake or gingerbread recipe and use these cookie cutters to develop some fun treats that you can enjoy. 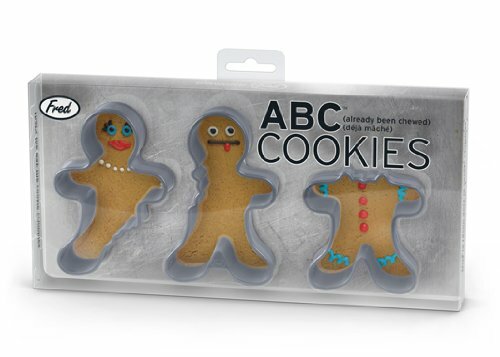 If you’re after cutters with a real festive edge then you can’t go past these gingerbread men cutters who have obviously not run fast enough to beat any zombies! Tucking into these treats should make it feel more like the traditional Christmases of old. To be honest as much as any zombie family member may have loved to receive the latest model of ipad, bottle of expensive cologne/perfume or a Fendi bag when they were still human about the only thing they want now is brains and that’s for their Christmas dinner! It would feel strange to not give them a gift though so here’s a few ideas that you could place under the tree for them. 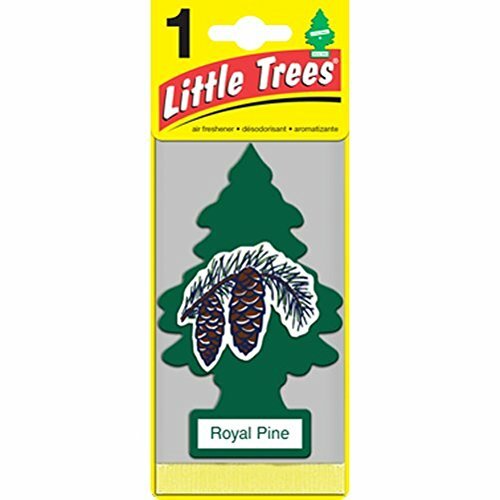 Car fresheners can be hung around their necks and help to disguise the stench of decaying flesh a little – it’s not exactly a wonderfully aromatic experience sharing a house with a zombie you know. 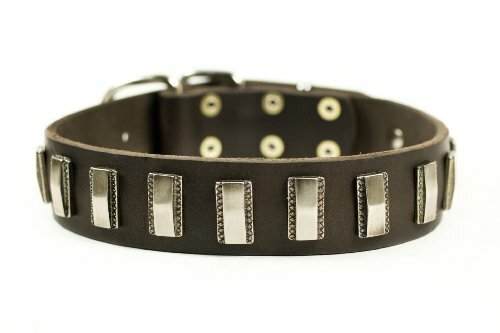 A new collar is a great idea as a lot of pressure is put on their collars as they pull against it in order to take a bite out of family members so it’s a good safety measure as well. This is a nice looking one in brown that might suit who you’re buying for. For the human members of the family you can get a range of different things that they might enjoy, but there’s also a range of zombie inspired gifts that you might think are more appropriate this year. Will You Be Having a Zombie Christmas This Year?